This has been an amazing year for young adult literature, and it’s been especially gratifying to see the number of astonishing debuts we’ve seen. In thanks to the publishers for taking a chance on unknown talent, in thanks to our readers for their enthusiasm, this week we’re taking a little peek at three promising upcoming 2013 debut authors! Each day, we’ll be showcasing a brand new YA author, who will share a Thanksgiving memory with us. We’ll also be offering up their downloadable recipes and giveaways, so be sure to check back daily! 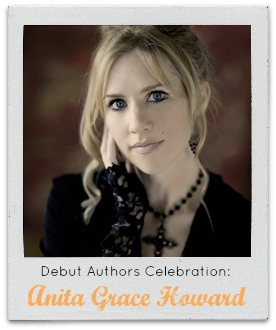 To kick off the celebration, we’re starting off with A.G. Howard, the author of Splintered. If you follow young adult literature, you probably already have this hotly anticipated title on your radar. It’s the story of Alyssa Gardner, who hears strange whispers…and finds herself going deep into the rabbit hole as she discovers a family curse leading back to her ancestor Alice Liddell, the real-life inspiration for Alice in Wonderland. Alyssa must overcome tasks that test her courage, as well as choices that may break her heart. I’m very excited to read this book and I’m sure you are, too! We’ll have to wait a couple more months until Splintered is released, but in the meantime, Anita shares a Thanksgiving memory and recipe with us below. When I was young, my grandparents lived on a farm in Whitharral, TX, and we would head up to visit them a few days early before Thanksgiving. My brother and I spent many a chilly autumn afternoon outside in our coats with our cousins, chasing turkeys through a crinkly carpet of leaves. Inevitably, we’d name the fastest birds. We figured it was safe to make pets of those, because they were the skinnier of the lot so there was no chance they’d end up as Thanksgiving dinner. The plan was foolproof until one year we left the pen open and all of the turkeys escaped but the skinniest one who was exhausted from winning the races. Little Joe was invited to Thanksgiving dinner that year, and there were many tears and gnashing of teeth during the carving. Now, I am a writer, and I’ve always loved a good yarn. So it’s possible I might’ve embellished a little. At least two facts above are true. I’ll leave it to you to decide which ones they are. Hope you have a wonderful stress-free Thanksgiving! And remember: never name your turkey. It can only end in sadness. 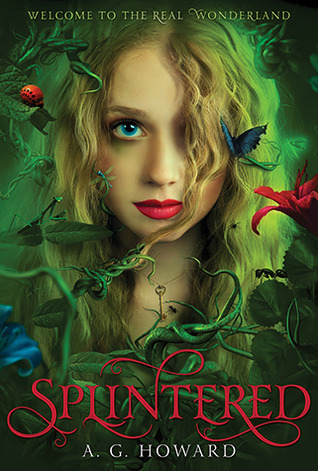 Splintered will be released on January 15, 2012. 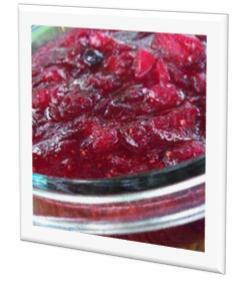 Download A.G. Howard’s recipe for Pear-Honey Cranberry Sauce! Be sure to let her and us know if you enjoy it. A.G. Howard was inspired to write SPLINTERED while working at a school library. She always wondered what would’ve happened had the subtle creepiness of Alice’s Adventures in Wonderland taken center stage, and hopes her darker and funkier tribute to Carroll will inspire readers to seek out the stories that won her heart as a child. When she’s not writing, A.G.’s pastimes are reading, rollerblading, gardening, and family vacations which often include impromptu side trips to 18th century graveyards or condemned schoolhouses to appease her overactive muse. Keep in touch with Anita on Goodreads, FaceBook, Twitter, and her website. Photographs courtesy of the author and D. Sharon Pruitt. Grab the Debut Authors Button! By the way, if you’re thankful for debut authors too, feel free to share the love by grabbing the button at the top! We’d appreciate a link back to our blog if you decide to use it. Be sure to join us tomorrow for another Thanksgiving recipe from another 2013 debut author, too. Oh boy, this book is one of my most awaited books from 2013. It sounds like everything I want in a book <3 Great post! She looks like someone I’d love to hang out with. Is she the same girl in the cover? We really lucked out–Anita wrote a great story. :) Thanks for stopping by! Love that memory! My dad’s a big softy, so he always named the goats. They ALL became pets. He’d even get out there and roughhouse with ’em. :) I love the sound of Splintered! And I’m going to have to try that recipe! Aww, my mother-in-law has always wanted goats! Did you get lots of wonderful soap products and cheese? What kinds of names? I MUST KNOW. I grew up in the suburbs so I’m always fascinated by talk of farm-type life. Just requested Splintered on NetGalley after attending a panel on YA bestsellers. Anita’s agent RAVED about this book. Crossing my fingers! Ooo, really? Always a good sign when the agents are enthusiastic, since they see so many titles. Hope you enjoy, Jen! Agreed! The concept is so unusual, I’m happy that this made it to publication. She’s a tricky one, though–who knows if ANY of this is true! ;) I saw Sam’s 5 stars for SPLINTERED, that makes me very, very hopeful. 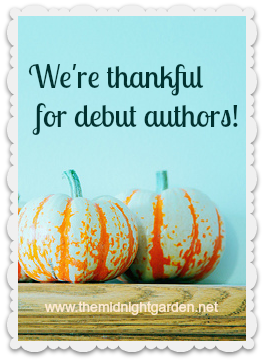 I’m thankful for new authors as well! They give new and exciting books to look forward to reading! Oh man, I’m quite hungry right now and that recipe just sounds so sumptuous. Sigh. Now where to find one?? I wish every copy of SPLINTERED came with a helping of this sauce. *sigh* And hah, thank you! YUMMM! I will definitely try this recipe one day!! *writes it down on my recipe book* My sister is reading Splintered right now, and she’s really enjoying it! Cant wait for me to read it!! Thanks for sharing! I feel like you could probably just spoon this into your mouth and you’d be really happy. :) And yes, the book has so much potential to be AWESOME! I’m hoping to read it right after the holidays. THIS STORY MAKES ME SAD AND HORRIFIED. AND REMINDS ME WHY I BECAME VEGETARIAN. Seriously though. THIS BOOK. WANT. But aww, you are the sweetest thing and we love you to pieces, too. As for the last bit, shhh! What if someone else notices?! And by real person, I mean non-cartoon version… not… like… you’re not actually a real person. I think it’s awesome that publishers give new writers a chance, and we’ve been seeing some really good debuts this year. Thanks for stopping by, Lucy! Holy crap on a cracker, that cover……. It’s so gorgeous in person, Lyn. And I keep seeing 5 star ratings from friends, so I’m not going to be able to resist this one much longer! Oh my God that is the most depressing Thanksgiving story I have heard! Great feature ladies! Hah hah, only if it’s TRUE. I love this idea of sharing Thanksgiving memories! I definitely could not eat anything I had named before its death. LOL That recipe sounds yummy! Thanks so much for sharing!!! We thought it might be nice to do something a little different with the authors this time. :) I’m glad you enjoyed the post! Right? Just about everyone seems to love it! I love the idea of an Alice story that is even more dark and dangerous. Thanks Keertana! We were lucky that the authors we invited were gracious enough to play along, hah. I love this cover! And that cranberry sauce sounds amazing. It’s gorgeous in person, Tonya–the colors are so vivid. It would make an awesome Vogue cover shoot, hah. I am sorry I didn’t get this one, maybe I should see if I can still. I am starting to hear good buzz. I agree we have had a whole crop of wonderful new debut authors this year and I don’t know how 2013 can top it but let’s hope it does! Here’s hoping each year just brings us an even better bunch of YA debuts, Heidi! Haha, I loved that story! Although, I’m horrible at picking out the truths/lies in a story (I’m extremely gullible…) so I’m not even going to try to pick out the 2 truths. But the story was too fun to read. =) I’ve been looking for some cool Thanksgiving recipes to make with my mom, and I will definitely have to try this out! It looks so delicious! Thanks for sharing Anita and thanks Wendy for hosting such an awesome feature. I will definitely be back tomorrow! Leave it to a writer to come up with something to keep you wondering. ;) Thanks for stopping by, Aneeqah! Ahahaha I just giggled out loud imagining turkey racing. It sounds like a good festive side dish for any holiday. :) I really like the dishes our authors have come up this week, and I’m excited to share them! YES. I have started to wonder whether queries are now required to come with head shots, because so many YA authors are so pretty! Some of these authors could seriously model for the covers of their own books! There have been some handsome young gents making debuts over the last couple of years as well. I’m so curious about this book, the cover is just awesome! Just about all of my friends who have read it have loved it, Melliane. :) I can’t wait! the cranberry sauce sounds yummy!! It sounds like something that would taste really good as a frozen dessert, hah. Maybe a granita, the flavors sound like they’d go really well together. Yeah, that’s when you get all attached, hah. And thank you! Happy Thanksgiving to you, too! Ohh that recipe sounds delicious! If I was cooking Thanksgiving dinner I would try to make it, but I’m not. I will definitely make it a different time though. The lemon juice and lemon zest are what make it for me–I’m not normally a big cranberry sauce person, but this one sounds delicious!